Having played a great many standard games over the years, we have found ourselves increasingly customising games and adding themes and loose narratives. In one previous Trilogy style game with the Sheldon Gang our Investigators took on solid characters as we discussed what and how they acted. As all members were part of the Sheldon Gang, we realised they had a reputation to uphold, and as a result they would ALWAYS take the gamble in any decision showing they were more daring than anyone else. They would always go for the money above anything else, and they would always be as mean to the people of Arkham as events would allow. These types of self-imposed restrictions were developed through the game as thematic aids and added a really unique angle to the entire adventure, often leading the gang-member investigators to make what we could see were tactically bad decisions, but became really what we thought the arrogant crims might do. No matter how dapper he might seem, give that there Dexter Drake an identity in such unpleasant company, and he will forever be regarded as one of the greatest and most ruthless gang members it is possible to play. And so, it is on the back of (more or less, because UB and BT have still had a good handful of small games since) the Sheldon Gang Trilogy in October, we decided to put forward a new Investigator grouping that we might play as part of another short series. To combine an intimate knowledge of the rules with narrative themes makes for intensely epics games, and this game would be extremely different to all that we had undertaken over the past four or five years. This time, it is the often much neglected Silver Twilight Lodges time to shine! Draw 8 investigators from the existing complete investigator set, that might each be connected to the Silver Twilight Lodge. A restriction in selection meant that we avoided investigators that have recently featured within other large scale concept games (Feds, Sheldon Gang, Miskatonic etc). They ended up being (and in no particular order): Norman Withers (Astronomer), Wendy Adams (Urchin), Luke Robinson (Dreamer), Jim Culver (Musician), Patrice Hathaway (Violinist), Diana Stanley (Redeemed Cultist), Jacqueline Fine ('Phychic' [sic]) and Gloria Goldberg (Author). The Silver Twilight Lodge is a pseudo-masonic religio-magical fraternity headed by Carl Sandford, and appears loosely based on the historical Hermetic Order of the Golden Dawn (Golden Dawn = Silver Twilight... get it? ), and as was the G.D., we figured the S.T.L. would itself likely be populated with those of a creative bent, although to be sure, we would have included the politician and the lawyer, if we had not just played a stand-alone game with them in response to the Sheldon Gang Trilogy, which is a story for another time. Because the Lodge is trying to gain power for itself, it has fallen prey to the privations of those denizens of beyond, and has entered into all manner of infernal and diabolical machinations. The result is that the Lurker on the Threshold is a must expansion to play because it is thematically tied to investigators negotiating various 'deals with the devil' much as the Lodge operates normally. We would also be including the Innsmouth Horror board (and track mechanism), along with the artifact rich CoTDP. On occasion the Dark Pharaoh would also appear as a herald, along with Hypnos and Nodens. It has become a staple of Trilogy themed games that we use the same expansions and boards in every game to provide thematic consistency, while allowing the Ancient One to change, and as a result introducing often extremely potent shifts in game dynamics. Having become disaffected, our Lodge members would be trying to bring down the Lodge from within, by destroying the Ancient One. As with the thematic Sheldon Gang Trilogy game, one location - this time the Silver Twilight Lodge - would be a focal point. Visiting this location would always offer an investigator either "double-events" as we colloquially call it (draw two encounters and select one) or +1 to all skill checks made during a single encounter; to be declared before drawing the first encounter card. In addition as part of the theme, each player would start with a Silver Twilight Lodge Membership meaning they would access the Inner Sanctum encounters until such a point that they lost the Membership. This operated the same way as giving each Sheldon Gang Investigator a membership at the start of the game. In the case of Diana Stanley, who starts the game with the Membership as part of her character base set up, we elected to allow her to draw the first $5 worth of Unique Items as compensation. In response to the boons of membership with the concept came the additional burden that should a gate ever open at the Silver Twilight Lodge, all investigators must seek to close and seal it as the top priority no matter what other game dynamics were at play excepting perhaps either directly winning or losing the game. The set up of the first game included Innsmouth, Lurker and CoTDP with both Heralds, and with Nodens as a Guardian. Each player (UB, BT, JT, CD) chose a starting Investigator from the short list of eight. UB chose Diana Stanley. He began his turn with her, running straight into the Exhibit and having an encounter in which she ended up both Cursed and Tainted. Over the next few turns she would also become Harried. This pattern of behavior was to repeat itself almost step for step in the final game of this trilogy. Right off the bat we began repeatedly drawing 'no gates but add two doom tokens' cards during Mythos which meant very few gates were ever open to generate game play, while the doom track advanced very rapidly. I think we had three of them in the game which amounts to three additional doom tokens, and further means that unstable locations do not get sealed because no gates have opened, and as a result there are few monsters and gates to claim as trophies for our investigators to buy the second tier advancements. Given the degree to which we know and understand the intricacies of the game we made some appalling decisions. Chief of all was to neglect the small print on the Ancient One. We had elected to fight Yibb Tstll, being one of the less frequent Ancients Ones we wage battle with. It clearly states that it takes twice as many hits to remove a doom token, and given there were four Investigators would mean 8 hits per doom token, resulting in a total of 88 hits to overcome and banish the Ancient One. This we had overlooked until the final fight was upon us. But wait, there's more. Diana, in a character driven frenzy ended up making a deal with the Lurker on the Threshold for a Bound Ally meaning that, come the final battle, each bound ally adds a further hit required to remove each doom token. That bound ally was worth a further 11 hits bringing the total needed to 99. What makes this so savage is that, despite us using deft skill to hoover up clues from the board, when the game came to a crashing end, bringing the final battle into play very quickly we had a total of 10 clues left on the board, all of which combine to provide the -X figure for the combat check. In this case we ended up squaring off against an Ancient One with -10 on its combat check (minusing that many dice from the total accumulated dice each investigator uses in a combat round) and a necessary 99 hits to defeat it. Yibb Tstll, still gets the better of us... by miles. What would make this second game interesting is that our group would be comprised of the rejects from the initial game. This invariably means playing a character that one is less familiar with (although, did i mention we have played this game relentlessly for years, so have played everyone over and over again). It would turn out to be an incredible game, although it was insanely long. Expansions played: Innsmouth Horror (not heralds), CoTDP, and Lurker, Nodens and Hypnos and Tulzscha. Note in this game only the items provided by those expansions were added (having recently split up all of the packs, where we might normally just have all the items from all expansions available). The Theme rules: The four surviving Investigators, alongside the usual attempt to beat the Ancient One, were also tasked with spending 1 Gate Trophy in another world to 'buy back' one of the Investigators lost in the previous game. The intention for the final game would be play a game set up for 8 Investigators, but we would only with the total investigators rescued and survived this game. This really amounts to little more than a possible 4 Gate Trophy penalty in the game, as none of the rescued Investigators would feature within this installment. As it turned out, right before the end of the game, Luke Robinson, the Dreamer, returned to another world and bought back three of the four missing investigators from the previous game, and Jim Culver, the Musician, returned Diana Stanley, the final one. The Ancient One was Abhoth, who introduces into the Arkham stage of the game, the three 'Child of Abhoth' which are horrendously villainous. We were lucky to have only had two come into play, and i cannot recall if we managed to kill any or all of them. It was about 3am when the final battle rolled along and, our minds a little addled, we yet again overlooked one crucial part of the Ancient One. We had managed to win without any devourings, and by getting sufficient seals down on the board. This in turn allowed us the 'turns grace' we grant winning parties before they deliberately 'go after the ancient one' (it obviously distorts the nature of the threat, but we always like to have a final battle whether we win the board or not). What we overlooked was the option to get rid of up to three items per investigator each round of combat against Abhoth. This meant we blew our clues where old items might have been discarded. SET UP: Arkham, Innsmouth, CoTDP, Lurker, All expansion items available, Hypnos Nodens, also included for extra pazazz was the Herald Tulzchsa, who among other things makes Cultists elusive and Elder seal destroyers. Because eight investigators, an expansion board and two smaller sets is quite cumbersome we divide game management duties into various groups. These generally follow the same pattern. The Mythos and Other World Encounters cards are grouped together - but the different expansion stacks are NOT shuffled in and are arranged in a line within the Mythos off-board area. This means that each time an investigator draws either a Mythos or Other World Encounter they roll a d6, with results indicating which deck to draw from 1-3 = Original Arkham, 4 = Expansion board (Innsmouth) 5 = Small Expansion 1 (CoTDP) 6 = Small Expansion 2 (Lurker). The advantage of this is dividing the cards up again after the game is much less awkward. This becomes particularly important when you are playing a couple of times a week, and engaging in multiple thematic games. All eight members, having survived and been saved during the second installment, have been reshuffled and shared out between the four players so that each player is playing two investigators they did not play in the previous games. This would be the first time that two of the players had multiple investigators (JT & CD), which proved to be a struggle at times, as they would draw clues from the wrong piles, or deliver items to the wrong character. It was interesting to see this because myself UB and colleague BT both play multiple Investigators so frequently that such muddles no longer occur, and neither of us are ever confused about the allocations and abilities of each investigator (indeed, i would say playing two Investigators per player is pretty standard in our games). I make this remark because it is presumably exactly the same degree of confusion that arose when we began the third installment of the Sheldon Gang Trilogy - with two players playing eight Investigators. That really was rather mind melting. It is really interesting to be playing what amounts to other peoples investigators from the previous games in the same campaign. This means that, within the last two games, all of the players have only been playing the same collection of characters, being able to share immediate individual insight, rule clarification/exploitation and reminders of the investigators previous escapades. However, despite this relative triviality, this is probably our most feared and least played Ancient One , purely because, when it comes to the final battle it combines both Magical and Physical Immunity, a devouring every turn, and no allies. That's right. It basically has weapon immunity, and kills an investigator every turn. Our plan to deal with this? Stack up on skills, items and spells that affect investigators base fight including Voice of Ra, Summon the Beast Within, Marksman, Grapple etc. These would all add to and affect the Investigators themselves rather than directly assailing (and failing against) the Ancient One. It would seem, and indeed is, really quite the challenge to rack up sufficient hits against this god, given that he is devouring a different Investigator every turn. But with 8 Investigators we felt we would at least be able to get some of them through a few rounds. Within our initial set up between all 8 of these investigators we drew three Elder Signs (Adams' starting one, Diane as her free $5 unique items, and another somewhere) and also various of the three 'Fragments of an Elder Seal'. Our path was set: The gate sealers - Dreamer & Astronomer would start getting seals down, then we'd stall on the seals after three, allowing the Urchin to pass her personal story and before the Dreamer failed his (the fail being on four Elder Seals down without first having acquired 3 Gate Trophies, as task similarly put by the Astronomer's personal story). (As it would happen, the opportunity came for Patrice Hathaway to search the Unique Items deck for the card of her choice, and given that we had ended up following the Elder Sign route it was decided that we pursue it with gusto, and another Elder Sign was chosen). Make Wendy Adams a light-footed item bank. Her abilities means she can pass unimpeded most places. All players would always unload all but essential items and cash to her, and she would run around delivering what was needed, where. This is much the same role as was given to the Bootlegger during the Sheldon Gang Trilogy, and is a highly recommended tactic. Patrice, as the omnipresent clue bank, would as usual, hoover up as many clues as possible, and be fed any and all items that generate clues (Tomes etc). Jacqueline the Psychic would take a support or combat role, depending on the development of her weaponry, with her special ability being very much an overseer level game player. Luke and Norman would both be on 'Gate Duty', while Gloria and Jim would be free to address issues arising as and when. Namely death-killin's. A gate opened and we began to move. Diana visited the Exhibit, where it would all go very wrong (see below), and the Astronomer made his way towards the first open gate, anticipating the Dreamer (who starts in an Other World, and is armed with a Gate Box) to return via the next gate should it open, or the first if not. The next Mythos card involved two gates opening BUT NO DOOM TOKENS ADDED to the track. If you can address gates with the bravery it deserves at the very beginning of a game, this type of Mythos card is excellent. As we busied ourselves with getting either the first tranche of gates closed and sealed, or the necessary equipment brought to the correct locations to allow such a thing to happen, we managed to get an Elder Sign and and Elder Seal fragment down, removing BOTH doom tokens that were now on the track. There came, very quickly, a point at which we were effectively starting the game over, but with two Elder Signs already down preventing gates from opening. This formed an odd reflection of the very first game in which no gates had opened and extra doom tokens were frequently being added. This time, when the gates did open, we were decimating the doom tokens. It was much less an actual play on our behalf and seemed increasingly like the game, or the Investigators within Arkham, had recalled the first failed game, and had modified to manage it. The luck of the cards, the draw and the dice had conspired not so much to make it easy, but to make it... effortless, if you can distinguish between such things. But the parallels did not end there. Supposedly 'redeemed' cultist Diana, had gained the Egyptologist skill in set up, and, despite the repeated warnings of UB who had done exactly the same thing with her during the first game, made a bee-line straight to the Exhibit which promptly Tainted then Harried her. Before many turns had passed, poor Diana, a persistently heroic Investigater, managed to acquire an injury, a madness, harried, tainted, and briefly the local guide. And yet her player (BT) was loving it. Despite repeated warnings from her player during the first game (UB) constantly warning that "exactly what had happened to her before would happen again" she was stubborn enough to repeat her previous mistakes in the most uncanny manner. While it seemed she really had not found any kind of redemption just yet, she was most certainly keeping the players entertained with her outstanding hubris. Of course, it might be argued that things had slipped too far for Diana when she took a Soul Pact with the Lurker. The notion of her as a 'redeemed cultist' seemed a little lost for most of the game, as she was, if anything, just a regular badass cultist. There was that one incident, when Diana stood in the Miskatonic Streets and played her Harried detriment to stunning effect, luring to her an elusive Elder Sign destroying Cultist away from an open gate the battered and bruised Astronomer was about to return through and seal. What made the powerplay of this move by BT so good was how it complimented the short narrative that arose as UB asked BT to share with the players quite how Diana acted when she summoned to herself the cultist - now known as Bernard, a family man, mostly involved with the Lodge as a social and business thing, and otherwise utterly unaware of the implications of the Ancient Ones - before proceeding to cut him to ribbons in the street. This action suddenly recalled a similar event that had slipped our minds from the very first game in which Diana had already brutally murdered the wife of Carl Sanford. Not all of our characterisations are this gruesome, and yet that is exactly what Diana presented, taking all of the players rather by surprise. That said, including such graphic narrative descriptions between poignant moments certainly helps to spice things up a bit. (On the gruesome theme, I recall a different game in which Skids O'Toole, the ex-convict, only killed one person in the entire game. It was a 'child of the goat' a paltry human, scantily clad and nubile. By taking her trophy we watched the story unfold of him using the Shotgun to rather embarrassingly overkill the poor wretch with an unexpectedly devastating role, before stuffing her into the boot of the Sedanette, and proceeding to drive around with her body in the boot for the rest of the game, him being otherwise unable to 'cash in' her shot-ridden corpse). The game rumbled on. We pounced on monsters as they turned up and we closed gates. Other powerplays that proved invaluable came in the intricate timings of arriving back from gates, sealing and banishing, with the Dreamer and Astronomer working as some kind of inter-dimensional double-act, with unrelenting use of the spells 'find gate' and 'control gate' in combination with Norman Withers special ability to select the dimensional symbol of monsters to vanquish when he closes gates. Find Gate - the spell that Norman starts with - is invaluable at speeding up the whole Other World process, which can sometimes leave an individual player seemingly burdened with what can be a very limiting task. (This point can be made to argue the case for playing with double Investigators, because sometimes, it just becomes your duty to be a Gate-Gopher, while everyone else is cavorting with Dholes, dealing with the Black Man or simply enjoying a delicious cannibal dinner at the old Witch House. This spell, Find Gate, is made even more potent when, by fluke, you start the game with two of them among your gate closers. But the stats for this game became seriously weird: At NO POINT in this entire game were there more than 2 tokens on the doom track. When we finally won, after almost 8hrs game play, it was Norman Withers (UB) sealing for the win, closing his 3rd gate, to complete his personal story, playing the last Elder Sign in the game, and removing the ONLY doom token left on the doom track. We won not only by having sufficient Elder Seals on the board, but also by restoring the Doom Track to 0 (!!!). It was a truly epic win, and one we had never thought actually possible to do, let alone ever play. But, throughout the game we checked back again and again to make sure there was not some stupidly obvious, or even dastardly cunning game mechanic we had overlooked but it seems there was not (except those few highlighted in this blog, but they might have not altered the game overly). The 8 Investigators gather around the Ancient One. Before them a pile of discarded allies will soon be joined with every last clue and item spent in overcoming Quachil Uttaus. We knew we did not have long. 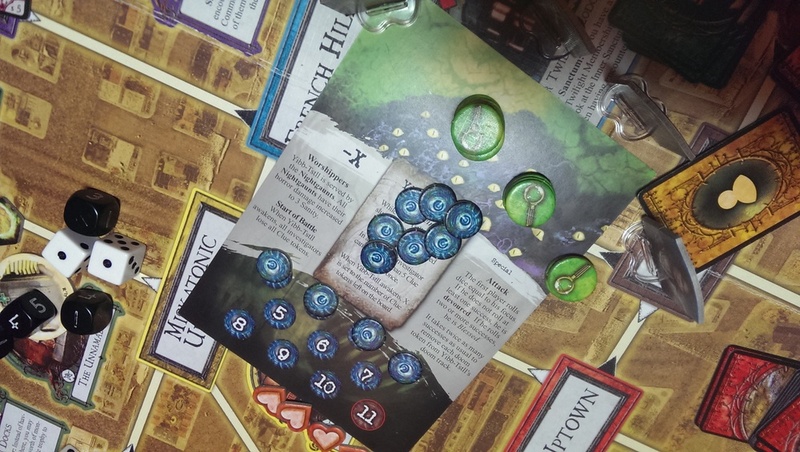 The game had developed so slowly because we had 'been all over it' from the start, that despite having won the game through seals, and by removing all of the doom tokens from the doom track, we found our investigators still ultimately under-powered for the final fight, particularly with all of our weapons and allies being ineffective. We elected to hit the Ancient One hard and fast. Given that the Arkham side of the game had finished and been won by Norman Withers placing the final seal and completing his personal story, he claimed his boon - rolling a D6 and scoring 5-6-6 -removing three doom tokens for a total of 24 hits. By anyones standing that is a seriously huge first blow. Then the battle began in earnest. The first epic battle card and Investigators attacked first. Having had the opportunity to choose the first player (see House Rules blog) Jim started the battle, knowing full well, as did ALL the other players, that we would only get one hit in before our killing blow came to smite that beast from beyond the stars. Jim was followed by Patrice, holding her clue bank at bay and using only her dark pact power tokens. Then came Diana, then Gloria, moving to Jacqueline and Norman. These latter two played by me (UB), both 'heavy hitters' in the Arkham phase of the game, were making combat checks of two or three dice. A travesty of a pittance... which only served to lull that diabolical fiend into a false sense of security, as one by one, each of these upstanding, and above all, responsible adults stepped aside to unleash our ultimate weapon: a small child. The killing blow would be down to the urchin, little Wendy Adams, where her modest stack of clues, her Blessing, Grapple skill, Fight+1, (... ? ...). And no, the Dreamer never even got a chance. The eventual skills and abilities and blessing of Little Miss Sneaky had granted a success to her combat check on 3-6. Her fight+1 had meant that every clue she spent on her fight base would add two dice. Thanks to the clue-strategy of Patrice, our dishevilled Urchin managed to rack up an impressive 51 hits on the Ancient One amply destroying in a single sweep the last doom tokens. We had won the follow up after our rather epic victory in Arkham, and were left with the following observations. 1) The Ancient One is certainly very scary and forces you to play a different strategy rather than stocking up on various fire-power. Not that we weren't dripping with items by that stage. 2) if we had not had several strokes of uncannily good fortune the game might have been unimaginably harder. 3) Our initial plan worked, and still seems like the only viable option. 1) Exceptionally lucky draws on the starting items. 3) Absolute team-play with specific roles within the group, altruistic behaviour and constantly redistributing items via the urchin who was our carcosian page carrying, high speed stealthy item bank. 4) Patrice Hathaway. Its almost impossible to lose a game with this investigator playing for the team.